I was positively giddy the week before the bell was set to ring; I plunked down $94 with the push of a button on my television remote for the fight that would launch boxing’s greatest comeback. I mean, what could be better? 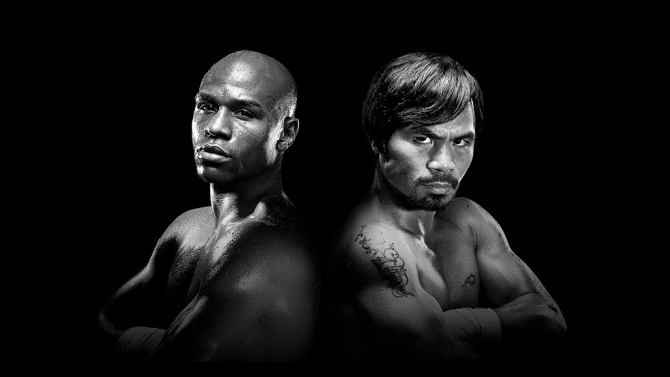 Mayweather versus Pacquiao. The most anticipated fight in at least a generation, and the 12 rounds that would bring boxing up off its near 20-year canvas. Boxing has suffered from a lack of superstars, and UFC/MMA has surpassed the sweet science in the sports pecking order. Twelve rounds and a plate of nachos later and I was clicking. Too bad it was a URL on YouTube that took me back to why I fell in love with the sport in the first place. Like a lot of other seven-year-olds in 1977, I had two primary obsessions: sports and Star Wars. While my sports knowledge was restricted to the daily newspaper, the school library and highlights on the nightly news, I ate, slept and thought about nothing beyond sports. From the NHL to the NFL and CFL, to the NBA and Major League Baseball, I was a confirmed sports junkie at this precious age. And in my advancing age, I was all too willing to expand my reach beyond the ‘big four’ sports. The only challenge to this obsession was, of course, Star Wars. Action figures, posters on my wall, clothing – if it was Star Wars, I wanted or obsessed about it, and I know I’m not alone. Whether you were a kid curled up on the edge of your seat in a theatre in 1977, or watched it first on videotape, DVD or via download, I believe that there aren’t too many boys who when they see Star Wars for the first time, their life doesn’t change. It began with a short briefing from my brother the night of September 29. He was seven years older, and as babysitter he was my ‘defacto Darth Vader,’ which meant no amount of rebellion would recapture my entire 11-channel universe. But somehow my brother had a different air about him. He’d always enjoyed being the ruler of my galaxy when Mom and Dad went out, but this was a night he was looking forward to. Muhammad Ali versus Earnie Shavers. ‘The Greatest’ against ‘The Black Destroyer.’ Fifteen rounds for Ali’s heavyweight title from Madison Square Garden in New York City. Right there on that grainy, 24-inch screen in the corner of the living room, and on national television no less. I know that by then I had a working knowledge of Ali in addition to my older brother’s spotty and altogether hyperbolic overview of his boxing career. The primary reason I knew him was simply because he was as much, if not more, mainstream than Lebron James or Tom Brady in 2015. 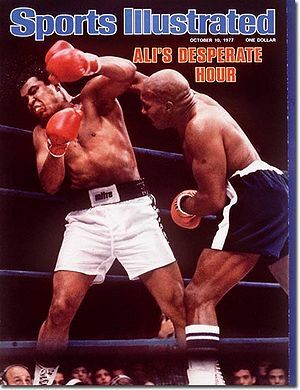 Whether it was a highlight on the nightly news, a variety show or even ABC’s “Wide World of Sports,” Muhammad Ali continued as one of the most polarizing and engaging figures in sports during at that period. I’m also sure I had options that night. It wasn’t like I was being forced to watch, rather, I was simply being brought up to speed on what would be on the television that evening. 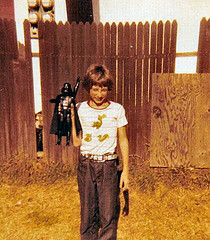 Minus the chokehold from The Dark Lord, who rather than wearing a cape, sported a Keep on Truckin’ t-shirt and bell-bottoms. While somewhat dismissive and bored, I was ready to pass on this opportunity and return to the Millennium Falcon, and then, I heard it. The opening trumpet blast of the music that was currently the soundtrack to my life. And there HE was. Fired up, talking, cocky, and led to the ring by the music and laser sound effects. Even though it was the stylized ‘disco’ version, I could handle it. I didn’t know much at seven, but I knew that disco sucked. No ridiculous entrances with Justin Bieber, Jimmy Kimmel, or the Burger King, just a bunch of guys surrounding Ali who looked even more determined than the man himself. While the theme from the movie was my personal “boxing tractor beam,” one epic round of trash-talk and a derisive rub of Shavers’ bald head by “The Champ” had me hooked, and 15 rounds later I found something else to obsess about. I took in a full 45 minutes of ferocity and technical skill, where Ali scored enough to win, but was wobbled more than a few times. Shavers had a lethal right hand that had him considered as the hardest puncher in the 1970s, and in spite of that big right hand, he still couldn’t match Ali’s best weapon in the latter stage of his career: his chin. And like me, in revisiting this fight, Muhammad Ali‘s ability to withstand punishment is second to none. After Shavers, Ali would only fight four more times; three of which were brutal losses, one worse than the next. 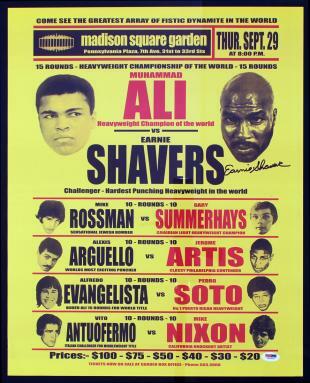 But most experts will say, including Ali‘s doctor Ferdie Pacheco, who quit Ali‘s camp after this fight, that it was Shavers who truly accelerated one of the saddest declines in sports. That fact would be quickly realized in due time and punishing detail for me, but from that moment, I’ve traveled with boxing through its ups and downs. Through Ali‘s decline, the astounding heights of the welterweight/middleweight divisions in the 80s and Tyson (of course), I maintained that passion. But without a polarizing, magnetic superstar, boxing and I, too, have been stuck for the past 20 years in a ‘black hole’ of non-appealing fights, and barely the occasional flash of hype from the likes of Mayweather, Pacquiao, De La Hoya, Hopkins, or Jones Jr., and plenty of embarrassment: ear-biting, fan-man, etc. In the past year or so, boxing has suddenly re-emerged. Interest has been heightened in cable fights on HBO and Showtime. 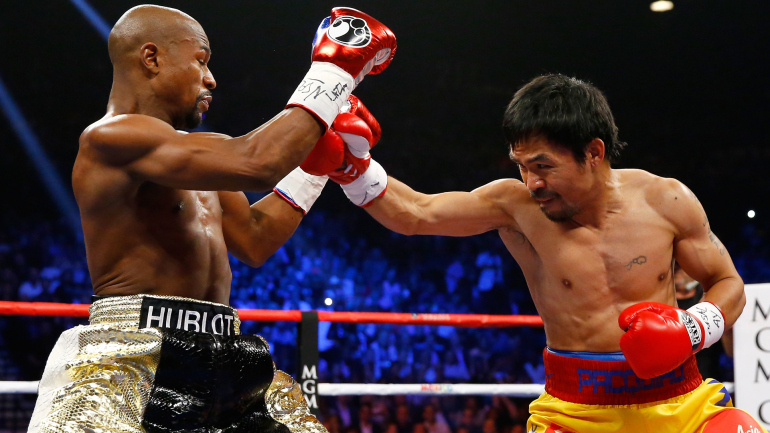 The hype for Pacquiao-Mayweather started in 2014, and the new primetime package on NBC has been stellar, with the network signing a multi-year, multi-million dollar package that even has the network bringing out heavy hitters like Bob Costas, Al Michaels, Marv Albert and Laila Ali to host and broadcast. For me, and for Madison Avenue, network and pay-per-view television, boxing was on an incredible upswing entering this fight. Pacquiao-Mayweather was going to strengthen the sport and pave the way for a new superstar (Canelo Alvarez? Deontay Wilder? ), and maintain the positive momentum that would come from this match of the century. Boxing is still on the ropes. And for a fan who was hoping this fight could re-launch his passion for the sport, you can’t imagine the disappointment. In a sport that you wouldn’t think could embarrass itself any further, boxing flopped that night with a 36-minute display of hide and seek. Brilliant defense? Perhaps. The last I checked, this was supposed to be a fight, and this was supposed to be the fight that brought everyone back to see what fans like me always believed that the sport could be if done properly, and maybe bring a new generation into what that seven-year-old kid saw with the Star Wars theme in his head. Two men, staring each other down, throwing and taking punches to see who scores or who puts his opponent on the canvas. Simple as that. It’s competition in most raw and beautiful form, not the track-meet and dance contest we saw at the MGM. May the Force Be With You(Tube)? There is plenty of talk now about injuries, penalties for non-disclosure, lawsuits and rematches. But I’m going to pass on another Mayweather bout. If he truly is going to retire and tie Rocky Marciano, my remote will suddenly be lost in the cushions someplace. For now, I’ll go back to my casual interest in the hope for a savior who isn’t on a movie screen, but is willing to stand in and fight. And every now and then I’ll find the mouse and take a look at a classic fight on YouTube. No matter what else might be playing, that old familiar theme will be in my head, along with the incomprehensible irony that in the same year a fight was supposed to bring me right back into boxing, a new Star Wars movie is coming out later this year. And if George Lucas doesn’t deliver? I’m calling Earnie Shavers. Kevin Donnan is a Contributor at The Scoop.